Artisanal tie dye printed pant. Printed viscose pant tie dye, light grey/white, with elastic waistband. 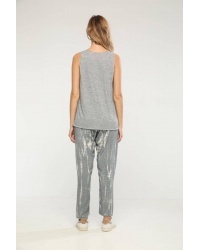 We love the fluidity of these pants slightly loose and comfortable. To combine with sandals or sneakers.